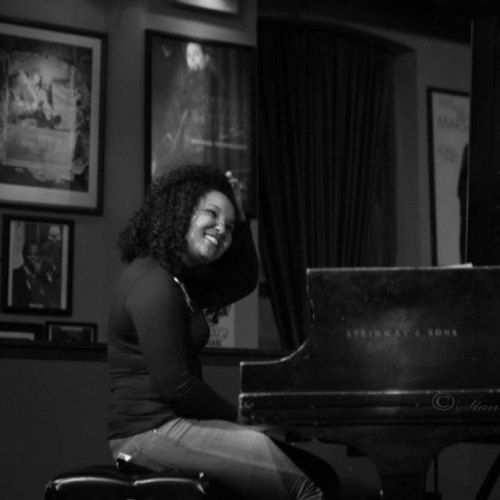 Alexis Lombre is a professional jazz pianist who is making her way onto the jazz scene. Raised on Chicago’s South Side, she discovered early that the true essence of music is not only about what you hear but, more importantly how music makes you feel. Consequently, she believes that her musical mission is to keep the ‘Soul’ in music alive. Alexis started classical piano lessons at age 10 but because of her attraction to the soulful sounds of Art Blakey and the Jazz Messengers and pianist, Gene Harris, at age 12 she switched to jazz lessons. At age 13, Alexis began participating in the Jazz Institute of Chicago’s (JIC) training programs which emphasized the importance of learning jazz on the bandstand. She began attending JIC jam sessions and then at 15, received the JIC Kiewit-Wang Mentorship Award to study privately with the legendary pianist, Willie Pickens. Alexis’ training was complemented by attending summer jazz camps at Juilliard, Centrum-Port Townsend and in Kansas City and Louisville. As a sidewoman, she recently performed at the 2016 Detroit Jazz Festival with the John Douglas Quartet, and at the 2016 Englewood Jazz Festival in Chicago with the Donald Harrison Quartet. In March 2016, she made her first New York City appearance performing with up and coming saxophonist, Emilio Modeste and his quintet. In her hometown of Chicago, she has worked with Charles Heath’s Next Generation Quartet, the Corey Wilkes Quartet, and the Rajiv Halim Quartet.